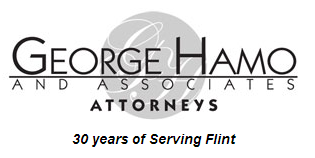 614 S. Grand Traverse St.
For over 30 years, George Hamo has provided excellent counsel specializing in negotiation and litigation of wrongful death, serious personal injuries, medical malpractice, and matters involving personal or business disagreements. George Hamo has been providing excellent counsel specializing in negotiation and litigation of wrongful death, personal injury, medical malpractice, automobile negligence, product liability, legal malpractice, securities fraud, and individual and business disagreements for over 30 years. Potential clients can have complete confidence in George Hamo and Associates because they have consistently achieved multi-million dollar recoveries and significant verdicts and settlements for their clients. "Because we go through so much together, people begin as clients but end up as friends." Hamo is a member of many professional associations such as the American Bar Association, State Bar of Michigan, a charter member of the Civil Justice Foundation, Brain Injury Association, National Spinal Cord Association, and Michigan Association for Justice. He is repeatedly selected by other attorneys and the courts as a mediator to facilitate a solution to complex and difficult disputes. Mr. Hamo has Bar admissions in Michigan, Pennsylvania, North Carolina and the U.S. Federal Court. He earned his Bachelor of Arts at Kalamazoo College in 1976 and his Doctor of Jurisprudence at Thomas M. Cooley Law School in Lansing Michigan in 1981.